Download "SPEECH OF H.E. MR. DOAN MAU DIEP"
3 international and regional conferences on human rights and conducted annual human rights dialogue with the U.S., the EU, Australia, Norway and Switzerland, thus strengthening the mutual understanding and attaining active outcomes. 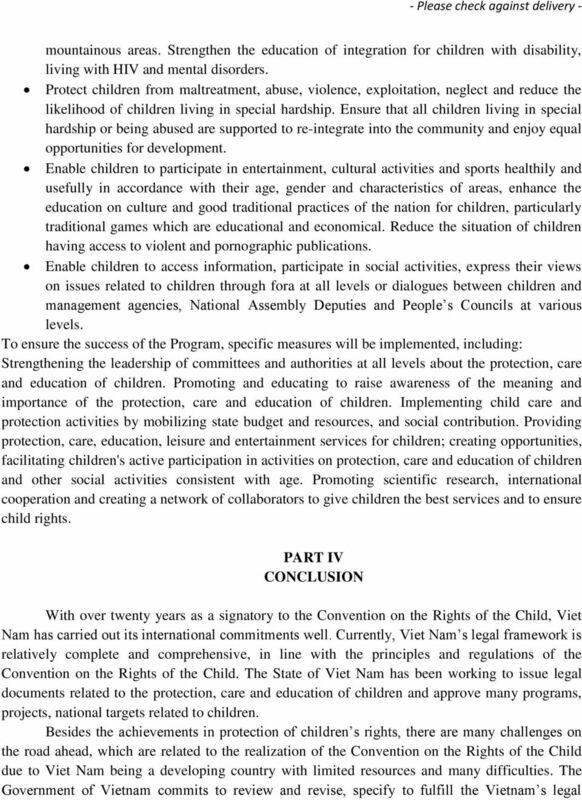 In the period of , Viet Nam has actively implemented international commitments and obligations related to children. Under the multilateral cooperation frameworks, Viet Nam cooperated with countries in the Colombo process on labor migration and worked with the Non- Aligned Movement on gender equality and women advancement. In these fora, Viet Nam committed itself to protecting the rights of female migrant workers and their families (including children), women, and children in general. Under the Coordinated Mekong Ministerial Initiative against Trafficking (COMMIT) including six countries (namely Viet Nam, Cambodia, China, Laos, Myanmar and Thailand), Viet Nam has ratified the 3 rd Action Plan for the period of related to human trafficking. 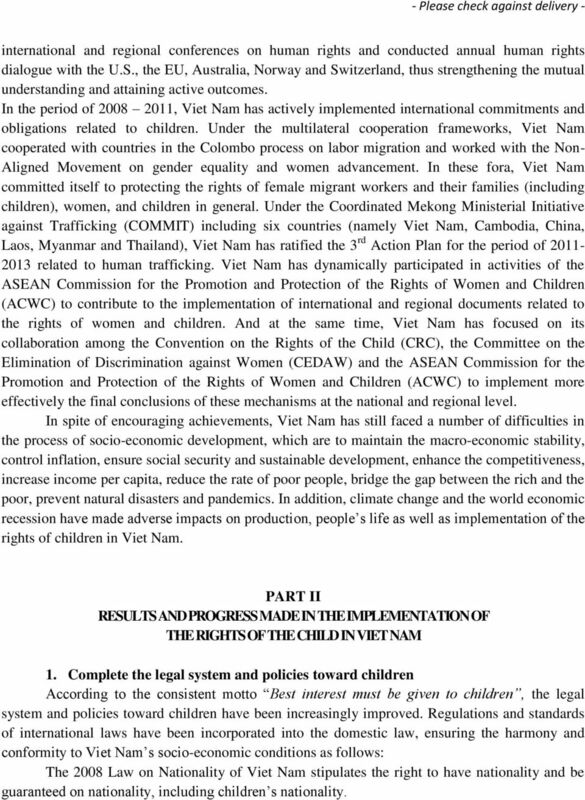 Viet Nam has dynamically participated in activities of the ASEAN Commission for the Promotion and Protection of the Rights of Women and Children (ACWC) to contribute to the implementation of international and regional documents related to the rights of women and children. 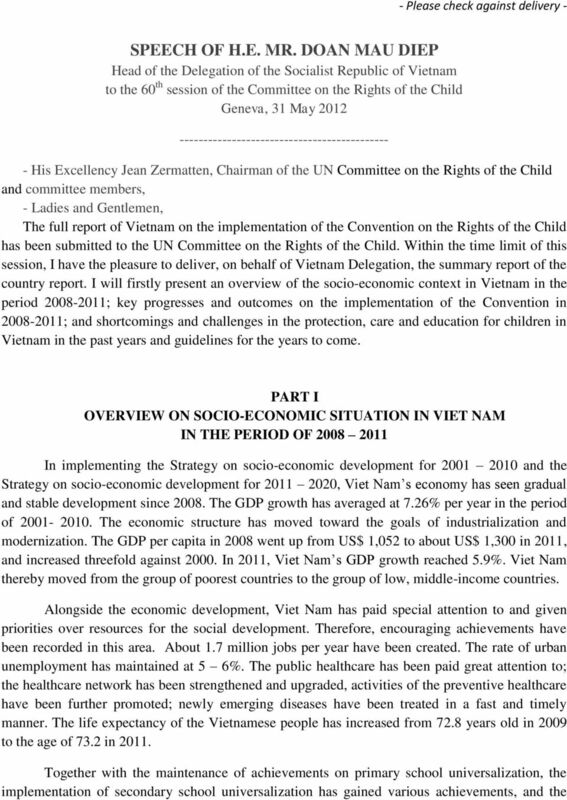 And at the same time, Viet Nam has focused on its collaboration among the Convention on the Rights of the Child (CRC), the Committee on the Elimination of Discrimination against Women (CEDAW) and the ASEAN Commission for the Promotion and Protection of the Rights of Women and Children (ACWC) to implement more effectively the final conclusions of these mechanisms at the national and regional level. 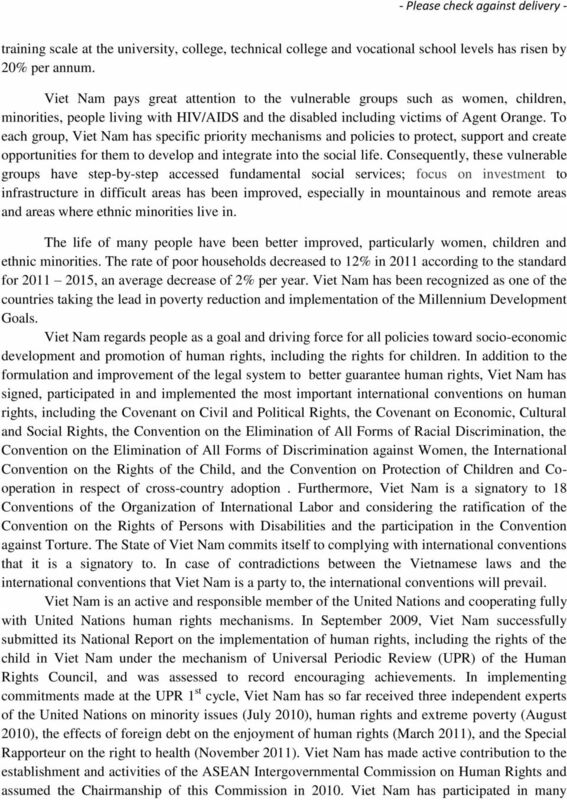 In spite of encouraging achievements, Viet Nam has still faced a number of difficulties in the process of socio-economic development, which are to maintain the macro-economic stability, control inflation, ensure social security and sustainable development, enhance the competitiveness, increase income per capita, reduce the rate of poor people, bridge the gap between the rich and the poor, prevent natural disasters and pandemics. In addition, climate change and the world economic recession have made adverse impacts on production, people s life as well as implementation of the rights of children in Viet Nam. 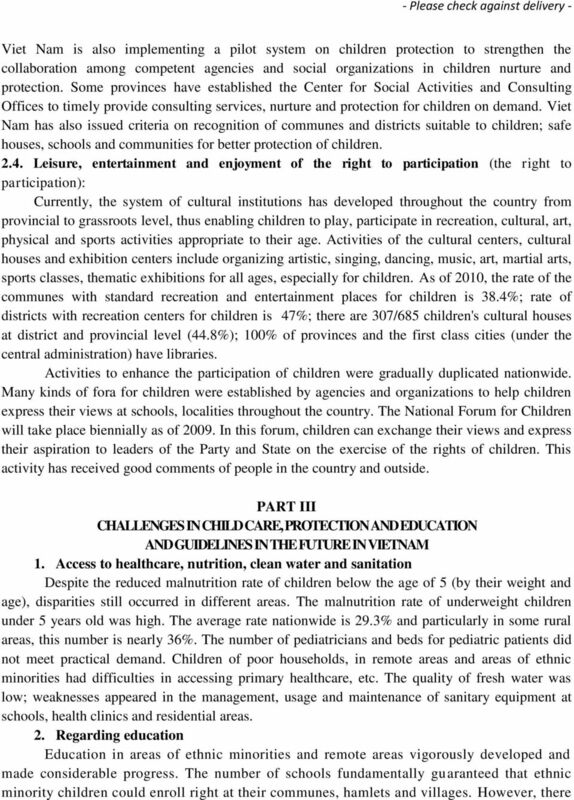 PART II RESULTS AND PROGRESS MADE IN THE IMPLEMENTATION OF THE RIGHTS OF THE CHILD IN VIET NAM 1. Complete the legal system and policies toward children According to the consistent motto Best interest must be given to children, the legal system and policies toward children have been increasingly improved. Regulations and standards of international laws have been incorporated into the domestic law, ensuring the harmony and conformity to Viet Nam s socio-economic conditions as follows: The 2008 Law on Nationality of Viet Nam stipulates the right to have nationality and be guaranteed on nationality, including children s nationality. 5 ; the Program on prevention of accidents and wounds for children, the Project on kindergarten universalization for children below 5 years old, etc. 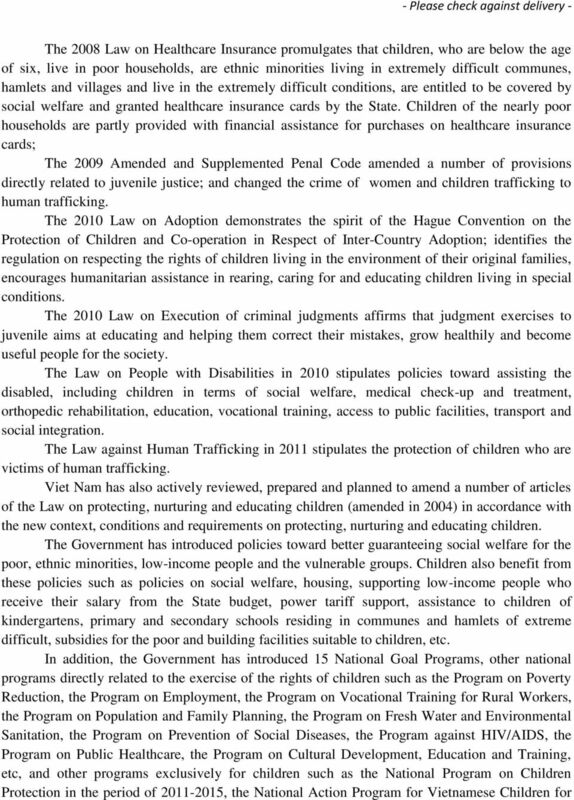 These policies and programs have significantly contributed to the advancement of the exercise of the rights of children in Viet Nam. 2. 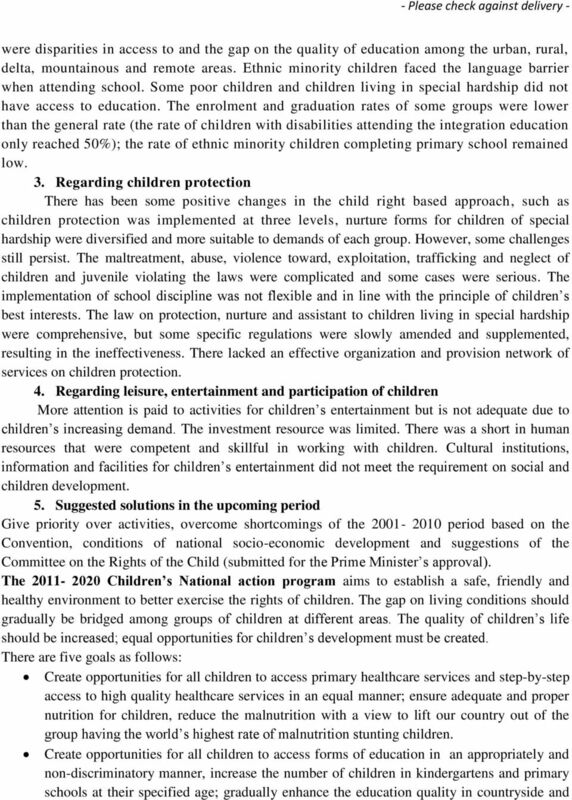 Progress achieved in protecting, rearing and educating children 2.1.Healthcare and nutrition (the survival rights): The healthcare system has been continuously improved in terms of staff, facilities and medicine. Most of the communes and wards have clinics. Children of poor households, ethnic minorities living in extremely difficult communes, and children under the age of six receive 100% free healthcare check-up and treatment. In 2011, there were about 66% of children covered by healthcare insurance. The investment by the Government in healthcare increased, accounting for about 6% of the central budget (it was 4% in 2007). The rates of malnutrition, infant and maternal mortality, etc have decreased Education (the development rights): The network of kindergartens, primary and secondary schools, both public and private, has developed nationwide. All communes have kindergartens and primary, secondary schools; 100% of districts have secondary schools. All mountainous provinces have boarding and day-boarding secondary schools for children belonging to ethnic minorities. The proportion of pupils attending school at their appropriate age at all grades grew in consecutive years from the school year of to that of The proportion of children aged 5 attending nursery schools has increased remarkably from 88 % in 2005 to 95% in The rate of pupils attending primary and secondary schools at their appropriate age also went up. Nearly 50% of children with disabilities have access to schools with specialized and integrated forms of education. The expenditure for education increased gradually per annum. In 2011, it accounted for 20% of the central budget (the figure was 14% in 2007). The building of schools safe and friendly with children increasingly expanded and gained fruitful outcomes, thus noticeably reducing significantly school violence. Educational equity has been ensured through favorable policies and social mobilization to support female children, ethnic minority children and children living in poor households Children protection (Exercising the right to be protected): Children protection was implemented at three levels (prevention; interference to reduce risks and support for children who live in difficult conditions and are vulnerable to recovery and integration). Forms of children protection living in special hardship were diversified and more suitable to meet the needs of each group. Therefore, by 2011, the proportion of children living in special hardship was reduced to below 6% of the rate of children in hardship nurtured increased to over 80%. The number of children who are in special hardship, poor households, ethnic minorities living in extremely difficult areas, are under 6 years old receiving support of the State increased rapidly. 100% of children living in special hardship, poor households and ethnic minority children were offered free-of-charge legal assistance on demand. All ethnic minority children received educational support through policies toward tuition exemption and reduction and other kinds of support, etc. 9 system, in line with international legal system, in order to annihilate any concerns, weaknesses regarding the implementation of child rights. On behalf of the Government of Vietnam and the Delegation, I would like to express my sincere thanks to the Chairman of Committee on the Rights of the Child and members, as well as other delegates for giving us the chance to deliver the report in this Conference. We look forward to your feedback and comments in order to implement the Convention more effectively. The Government of Vietnam expects a further support from the UN s Committee on the Rights of the Child, UNICEF, international organizations and UN s country members, in order to provide a better care, protection and education for Vietnamese children. Thank you very much./. Protecting Children in Zambia from Violence, Abuse, Neglect and Exploitation Baseline 2010: National Child Protection System in Zambia What is a National Child Protection System and why do we need it? Project Formulation Survey under the Governmental Commission on the Projects for ODA Overseas Economic Cooperation In FY2013. ANNUAL SESSION OF UNICEF S EXECUTIVE BOARD JUNE 2013 SPEECH FROM THE REGIONAL DIRECTOR FOR LATIN AMERICA AND THE CARIBBEAN. The National Assembly of Vietnam promulgates the National Law on Persons with disability.